Another excellent custard-centered cornbread that combines features of the North and South, and a wholly unique twist on preparation. The twist? A cup of milk is poured over the finished batter, resulting in a custard layer just underneath the top crust. Originally this cornbread was baked in a spider, a footed, long-handled skillet designed to stand in the fireplace just above the coals for heath baking. But now it's baked in a preheated skillet. Serve the "spider" bread still warm, but not hot, beside a bowl of stew or paired with an assertive salad. Preheat the oven to 350°F. Spray a 10-inch cast-iron skillet with oil, and set aside. Sift together the dry ingredients into a medium bowl. Break the eggs into a second medium bowl and whisk them well. Whisk in the buttermilk and 1 cup of the milk. Set aside. Pour a little of the hot butter or oil from the skillet into the batter, give a stir or two, then pour the batter into the prepared hot skillet. Now, here comes the odd part. Pour the remaining 1 cup milk over the batter, without stirring it in. Bake the cornbread in the oven until golden brown in spots on the top and quite golden around the edges, 50 minutes to 1 hour. The bread will still seem slightly wetter than most cornbreads, but if you poke a toothpick in the center, it'll come out clean. Let cool in the pan for at least 20 minutes before cutting, so the custard can set up a little. 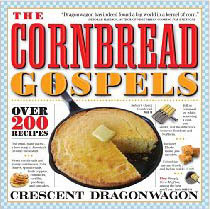 Reprinted with permission from the book THE CORNBREAD GOSPELS by Crescent Dragonwagon. Copyright © 2007 by Cresecent Dragonwagon. Published by Workman Publishing Company.